Implementation of Conway's Game of Life algorithm. 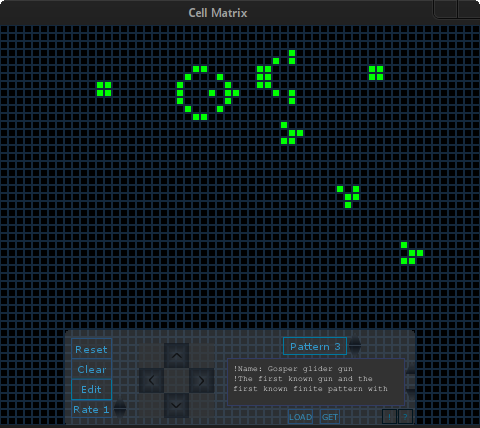 Cell Matrix is a Python program that codes the algorithm of Conway's Game of Life, which belong to cellular automata applications in which simple rules govern the growth of neighbouring cells arranged in a 2-dimensional matrix. The program starts with an initial cell seed and iterate through subsequent generations determined by four simple rules applied to each cell. Specific patterns can be entered into the program by editing the cells in the matrix and by retrieving a pattern from a file or the clipboard, ConwayLife.com has a collection of patterns to explore. The current version of Cell Matrix is available for download, and the development version at its Github repository. Dependencies include Python 2.7 and Pygame 1.9.1. Cell Matrix is released under the GPL v3 license.